Jahlil Okafor #8 of the Philadelphia 76ers separates Isaiah Canaan #0 from Roy Hibbert #17 of the Los Angeles Lakers on December 1, 2015 at the Wells Fargo Center in Philadelphia, Pennsylvania. NOTE TO USER: User expressly acknowledges and agrees that, by downloading and or using this photograph, User is consenting to the terms and conditions of the Getty Images License Agreement. 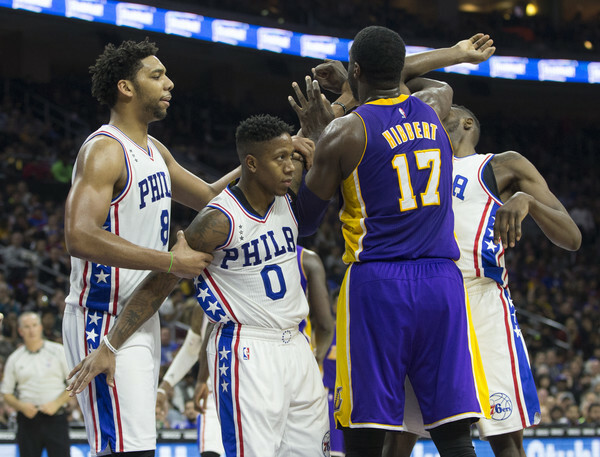 The 76ers defeated the Lakers 103-91.